Response: Around the world allergic respiratory diseases especially in children is a major problem. Studies have already shown that cord blood IgE can be used to identify children at risk for allergic diseases. Our previous research showed that exposure to high levels of outdoor pollen, especially grass, in the first couple of months after birth increased risk of allergic respiratory diseases. Based on this, we suspected that exposure to high grass pollen during pregnancy could be also important. MedicalResearch.com: Why was this study important? Response: Changes in climatic conditions, such as thunderstorm asthma, longer duration and more consecutive days of high grass pollen periods are associated with asthma and hay fever. It is a growing burden on susceptible populations and understanding this link has intensified. MedicalResearch.com: What did you do in your study? Response: We analysed the associations between cord blood IgE of babies born to mothers from Melbourne, Australia (The MACS study), Denmark (The COPSAC2000 study) and Germany (The LISAplus study) and outdoor grass pollen levels during the mothers pregnancy and at birth. Response: We discovered that babies born during the peak grass pollen in both hemispheres had high IgE levels in cord blood. Specifically, there were high IgE levels among babies born in October and December in Melbourne. While IgE levels were highest for German and Danish babies born around April – the peak pollen season in Europe. We also found being pregnant for an entire grass pollen season may have a protective effect on babies. This was a significant finding and indicates the possible development of a sensitisation barrier. Response: The study provides new insight that could help us predict and manage diseases like asthma – which are a significant public health burden. Our study did not suggest that all babies born during high pollen season would develop allergic diseases. 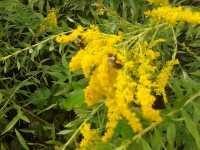 Nor that pregnant mother who were exposed to high pollen will give a benefit for their babies. This is just one step to help us pinpoint the exact timing of the risk of grass pollen exposure during pregnancy and at birth. More research needs to be done and currently we are working on studies to find the specific risk time periods of pollen exposure during pregnancy on asthma and allergies in children. This entry was posted in Allergies, Author Interviews, OBGYNE and tagged allergies, pollen, pregnancy by Marie Benz MD FAAD. Bookmark the permalink.